Salina Rush never knew what hit her. Despite the nine months and countless hours she spent preparing her Salon of the Year entry, she never imagined she’d win – let alone win Nail Tech of the Year and rank number one in the Top 25 list all in the same year. “It’s unbelievable. I wasn’t even planning on entering the Salon of the Year category at first because we’d just moved into our new salon and things were so hectic,” says Salina. She notes that this year’s entry was made easier by the score sheet from a previous entry. “I tried to learn from that and improve both as a nail tech and as a salon owner,” she says. Opening its new 1,800-sq.-ft. Wooster, Ohio, location in June 2000, the new and improved Studio 10 Hair & Nail Design offers a wide variety of hair, nail, and spa services. Savvy business sense and considerable industry experience facilitated Studio 10’s considerable growth spurt from a 400-sq.-ft., three-station salon to the full-service salon it is today. “We purchased an already-existing salon and kept its employees,” says Salina. 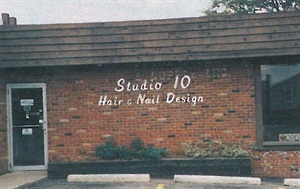 Despite adding a variety of services from tanning to toning tables, nail services remain Studio 10’s trademark specialty. The salon has been so successful that it has just added a fifth nail tech. With five nail techs, including Salina and her husband and co-owner, Tony, and three hair stylists, Studio 10 is poised to expand its services. “We are thinking about remodeling and adding services and staff. I am thinking about entering Educator of the Year for 2002,” says Salina. Studio 10’s seven staff members strive to not only meet the requirements of the Ohio State Board of Cosmetology’s continuing education requirements, but to exceed these requirements whenever possible. Salina and her nail technicians are accomplished nail competitors, regularly attending industry trade shows to remain current on industry developments. Competitions, Salina feels, are the best educational tools the industry has to offer. Industry participation is equally as important to Salina, who is a member of the NCA, and was recently named to The National Registry of Who’s Who for her measurable contribution to her profession and community. She also makes tremendous efforts to ensure that the salon remains active in the community by donating gift certificates, participating in food and clothing drives, and donating money to local charities.